Run homes for sale are in a small subdivision, one of the last developed, in the larger neighborhood called the Highlands at Breckenridge. It’s near the open Highland Park area, and lies along Gold Run Gulch Road, near the eastern section of the 27-hole public golf course in Breckenridge. These homes and lots lie along the beaver ponds and creek known as Gold Run, and is accessed from Tiger Road on the northside of Breckenridge, either by turning of Tiger east of the Breckenridge Public Golf Course onto Gold Run Gulch Road, or by turning sooner, further west, onto Fairways near the golf clubhouse and following the road to the intersection with Gold Run Gulch Road. Homes in this subdivision are some of the newest homes in Breckenridge. Conveniently located and spacious, real estate in The Highlands continues to be in high-demand. Keep reading about this small subdivision, or find available Gold Run homes for sale now. 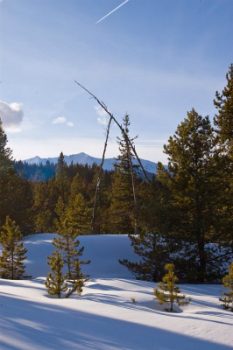 The Breckenridge Golf Course is within site of the Gold Run subdivision of the Highlands at Breckenridge, and an easy drive from any of the homes or lots for sale there. The course also serves as groomed Nordic ski trails in the winter. Additionally the open space trails close to these subdivisions is groomed but left as a more back-country ski experience and dogs are permitted in this area only. Size: 3458 sq. ft. to 5974 sq. ft.
Do you have any questions about the subdivisions in The Highlands at Breckenridge? Don't hestitate to get in touch by sending an email or calling us at (970) 453-2200.